What are the best 6 person tents to buy? It's difficult to choose a single one and call it "the best" due to the fact we all have different needs. More so as I have hand picked 43 different six person tents, from 12 different manufactures. Including different types, sizes and prices for us to compare. To make things easier I divided the 6 person tents up into 5 different sections, "shown below"
This way we are able to compare apples with apples so to speak. 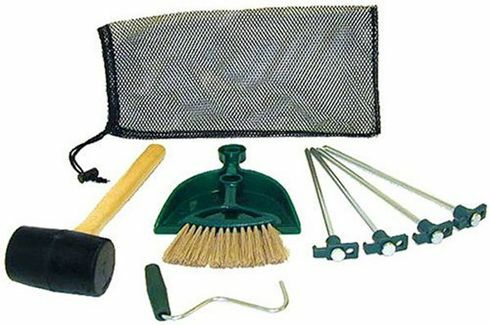 You can also read about the most popular sometimes a product does not fall into a simple category, it does though have lots of happy owners. Cheap does not always equal the best value often a little extra gets you a whole lot more. Then there are those that just have stellar reviews, for what ever reason they have great ratings and lots of them. TLDR To busy to read through each section? Jump straight to the best 6 person tents from each of the groups. Four of the 6 person tents have an excellent score and lots of reviews. 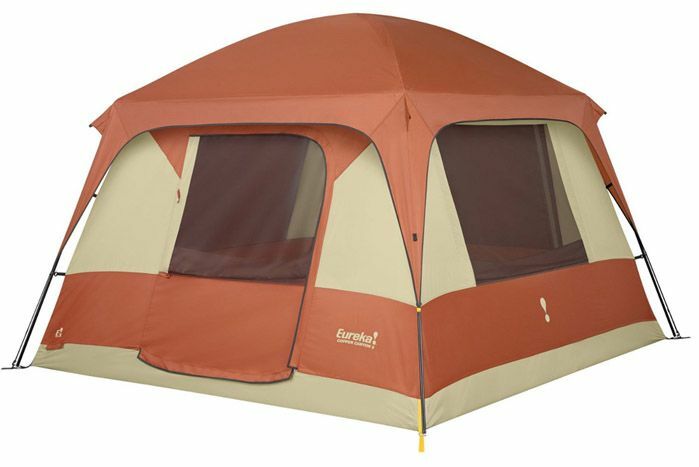 Kodiak's Flex Bow Deluxe 6 Canvas tent first appeared around 8 years ago at the beginning of the 2011 season. Since then it has not missed a beat getting rave reviews year after year. Chris gives us a two year update in the video below which pretty much sums up all you need to know about this high quality tent and the manufacture. Quality comes at a price though. 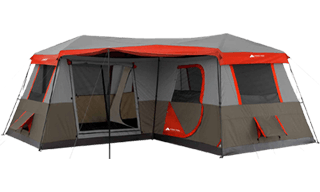 The least expensive of the four is an instant cabin tent made by Core Equipment "pictured below" it sets up easily in a couple of minutes. With 99 sq feet of sleeping room and 6 feet of standing room, it falls squarely in the middle of all the six men tents, when comparing them all by size alone, for six people it could be considered just a tad small, the larger 9 person version costs around $70 extra making it a good deal for those wanting more space and privacy. 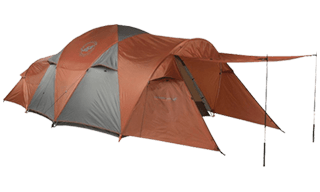 Kelty is another brand that has a long history of creating quality tents for camping, their Trail Ridge 6 excels in all areas except size. 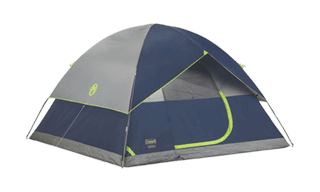 It is the smallest of the four and smaller than the largest 4 person tents for two or three people this would be a nice spacious tent. Also worth noting, is that Kelty has discontinued this exact tent replacing it with a newer version that includes a footprint, which previously needed to be purchased separately. At the moment it is getting quite hard to find this older version. Under normal circumstances the new one should perform just as well. Last of the four is one of Browning's largest tents. 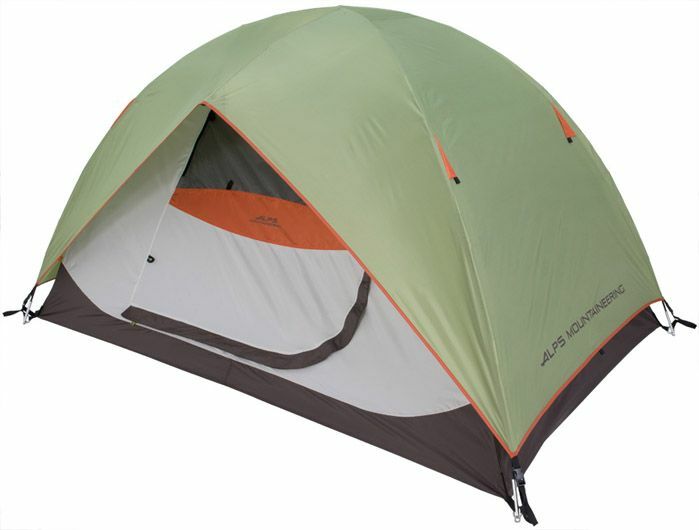 Belonging to the Alps Brands group it is easy to see why this tent has grown in popularity over the last few years. 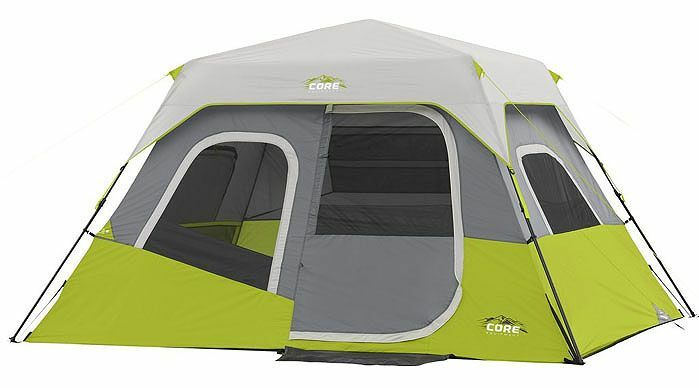 I first started to see sales of this tent back in early 2015 Since then rarely a month goes by that I don't see another couple of purchase during the summer months. With sales increasing significantly in the second year as people get to know about the brand. Browning's Big Horn checks all the boxes if your looking for a 6 man tent that's large in size and easy on your pocket. Another page containing thirty-six tents in total each with lots of reviews and great ratings, that I track daily, can be found here. All differet types of tents included on optimumtents.com are compared their. Yesterday morning twenty of the 6 person tents where discounted 20% or more. Needless to say choosing a product based solely on the fact that it has been deeply discounted, can be problematic. The three tents listed below all have good overall scores, and currently retail for a lot less than the average price per square foot for all the 6 person tents on this website. The most expensive of the three will only cost you $1.83 per square foot. Compared to an average price of $2.65 making it a good deal when discounted. Best of the three above, is the Mountaineering Meramac 6 made by Alps "pictured below" Yesterday morning it could be bought for the low price of $142.99 info_outline With 6 ft. 00 inches of headroom and 100 square feet of sleeping space, it is smaller than the largest 6 person tents that are covered in the next section. Only 1 of the 43 tents have 125 square feet or more. In a class of it's own, is Browning's Big Horn 6 with 150 square feet and 7 ft. 03 inches of headroom. 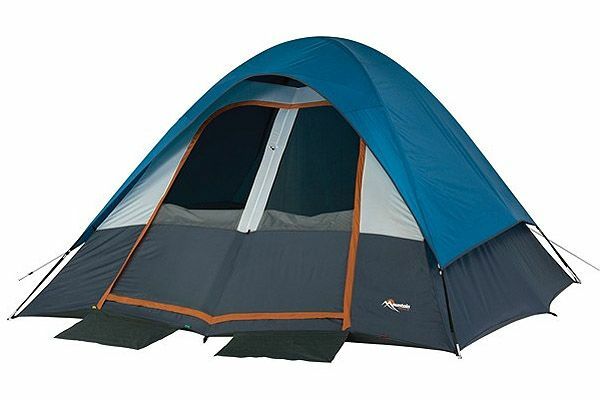 It's larger than the majority of tents advertised as been suitable for up to 8 people. Two large rooms each having their own doors and windows makes this a great tent for grown ups with teenagers, planning a vacation that lasts more than a weekend. 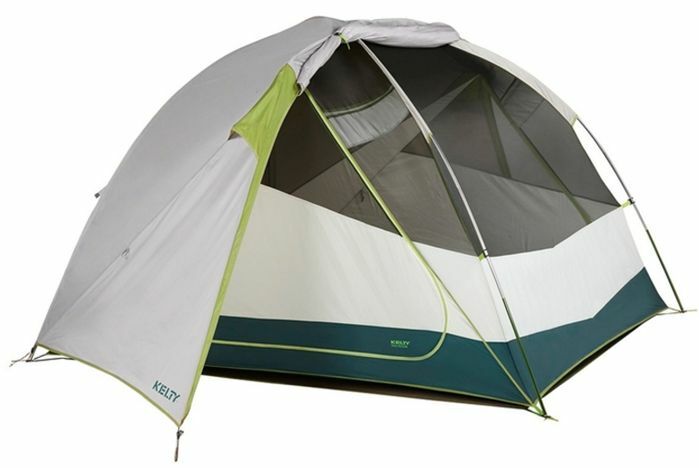 One of Kelty's newer three season models, the Trail Ridge 6 With Footprint get a honorable mention "pictured above with it's fly sheet" In it's self the 6 person version does not warrant appearing in this section, the larger 8 person version though has 120 square feet and 6'5" of headroom and only costs a little extra. Both are quality tents for serious campers who have budget of $400 to $500 First introduced in 2016 the model is available in five different sizes, all sizes are getting rave reviews. Its nice to see Kelty including the footprint, so you don't find out after buying the tent that you need to purchase a footprint separately. Yesterday morning nine of the tents where available for less than $125 info_outlineFour of these even cost less than $100 Within this group of 9 most score well in all areas, the two "listed below" really stand out from the rest, neither are normally discounted this much, making them both a good buy at their current price. 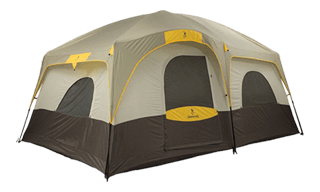 Another that scores well is the "Evanston Screened 6" it is covered in more detail below in the top selling tents section. 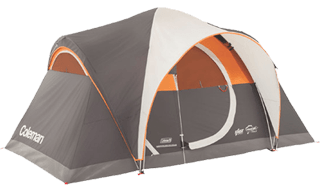 Another one that jumps out, is the Salmon River 2 room tent "pictured below" It is made by Mountain Trails a subsidiary of Wenzel With 112 sq feet of living space and 6' 9" max headroom in the center. It is good value at this price. 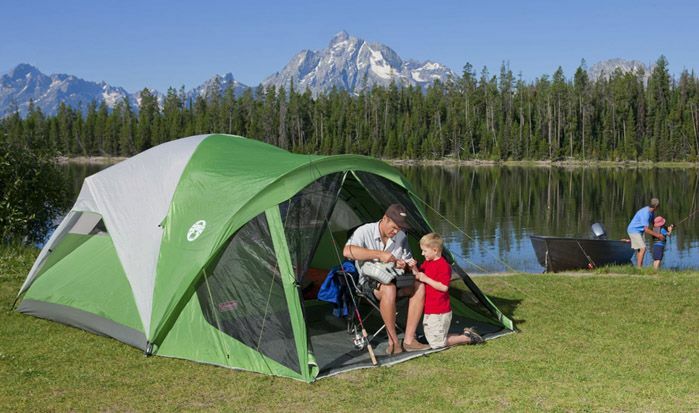 It is also one of the largest tents on the market in this price range. New campers not looking to invest much in a tent, that they may only use once, could do a lot worse for considerably more money. Coleman basically own this section with 8 of the top 10 selling six person tents that are in stock and currently available. It is worth noting that six of eight are in the process of been phased out as they are no longer showing up on the manufactures website. 2016 saw lots of new models replacing the old favorites. Second best selling is the Evanston Screened 6 pictured below. Just one thing keeps this tent from been an amazing tent, that is, it's "headroom" with only 5'8" in the center. An extra few inches would have been nice! Third most popular, is Coleman's Weathermaster 6 with porch. I have written about it and the "Elite and Standard version" here It has a lot of happy owners and a lot more headroom than the Evanston above. Browning's Big Horn 6 slips into the bottom of the top ten, making it the best selling of all when excluding anything made by Coleman. Another sneaks in, it is Suisse Sport's Mammoth It's a popular tent that has been around for quite some time and gets good reviews. It's always hard to single out one tent and call it the best, particularly when you are comparing 43 of them side by side. Campers require different things. With that I have selected five based on the data. These pretty much cover all the areas and should fulfill the needs of most folks. For those willing to invest more than a couple of hundred dollars in a good quality tent, two other tents are worth taking a look at. Second of the five is Kodiak's Canvas Flex Bow Deluxe 6 it gets stellar reviews. This is the type of tent that will last you for many years. It is a sturdy canvas tent good for camping in all seasons. The only drawback is it is quite small when compared to the largest 6 person tents. For an extra few dollars it is possible to get a slightly larger version You can see in the video at the top of the page that Sean Kent also gives it a huge thumbs up. Eureka brand name is well known and trusted by campers. It's Copper Canyon 6 pictured below. Like Kodiak's tent above, it excels in all areas except size, apart from this it makes an excellent choice for smaller groups not needing a lot of space. Last but not least of the five is one that shot to fame in 2016. In it's first year on the market Core Equipment's Instant Cabin 6 out sold many of the favorites that have dominated the industry. As advertised it sets up quickly, in under a few minutes. It is not expensive and to say the reviews are good would be an understatement. Copyright © 2019 optimumtents.com All rights reserved.